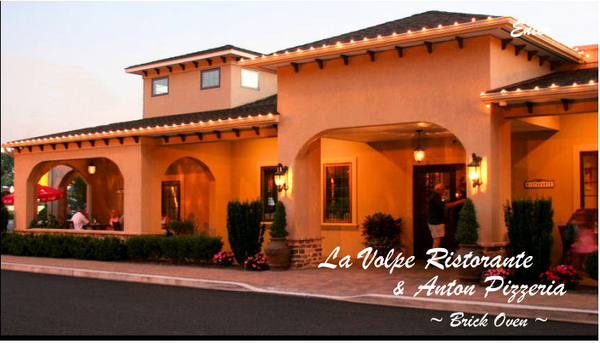 We have eaten at La Volpe three times and have had different experiences. This most recent time was surely the best and it is a place we can see ourselves returning to again. We couldn't say that after the 2nd time but I will get into that later. La Volpe is an Italian restaurant somewhere between casual and upscale, lets call it business casual. There is an adjacent pizzeria where you can order from the restaurant's menu as well if you'd like. When you walk in, there is a small bar to the left, a hostess desk to the right and the dining room is straight back. The restaurant feels homey and rustic while feeling modern at the same time if that is possible! There are posters and paintings of Italian celebrities, bookshelves, hand painted vases and water jugs and distressed wood throughout including exposed wooden beams. There are little accents everywhere you look that give it a special touch. The first time we ate here, we had a good experience. It was just the two of us plus our daughter, a baby at the time. Service was okay, not over the top but not bad. The food is what we remembered when we left. We loved it so much that we brought a group of 6 with us the next time. Bad idea. We were there for hours and hours because the kitchen was backed up. Not only was service slow, but we had seen our waiter maybe twice the entire night, had empty glasses, no apologies for service and it was overall an embarrassment to us for raving about it so much to our friends. It took some time for us to give it another chance. We returned just a few days ago to be completely blown away! Our waiter was extremely friendly, our glasses were never empty and food came out quickly and as expected, tasting amazing! There is a bit of everything on the menu (including pizza!) and although some dishes seem a bit expensive, portions are quite large. The first time we ate here we ordered calamari and it was absolutely huge for just two people! We knew next time we could skip an appetizer. Their bread is great as well, most particularly the rosemary foccacia. Some truly notable dishes are the almond crusted filet of flounder with mashed sweet potatoes, lasagna, veal saltimbocca, and ham-stuffed pork chop (a special). The pasta side can be with either tomato sauce or garlic and olive oil. If you like the latter, I can't stress enough to get it. It has fresh basil and browned slivers of garlic throughout. I'm actually going to change the way I make "pasta aglio" in our house because of how they do it at La Volpe! When it comes to dessert, there are so many options and you probably can't go wrong with anything you choose! It all sounds delicious. My absolute favorite thing on their dessert menu is the toasted almond tiramisu. It's another thing I will try to replicate due to how amazing it is here! La Volpe also has a few days with specials, a cheaper menu for those who dine before 6pm as well as wine and drink specials during certain hours. You should check our their website for the exact days and times as they do change. I am glad we gave La Volpe another chance and cannot wait to go back!